This is a wooden full view display case. The full vision large glass area allows for more viewing angles and more ambient light to illuminate your products. It also lets the maximum amount of ambient light into the case to increase visibility of the displayed items. This case features two tempered glass shelves which are both adjustable. There are sliding mirror doors which reflect more light to increase the visibility of items even further. The black velvet display area increases visibility by adding contrast to the products on display. Lights: Lights are available for this product. If you have a high traffic retail area this wooden full view display case is perfect due to its solid construction. The simple yet elegant design will fit in with any décor well. We also build custom wood glass display cabinets if this design does not fit your requirements exactly. Click here to view the full line of custom finishes we have available for this wood glass display cabinet. This full view design allows customers to easily browse products on display. It also lets the maximum amount of ambient light inside to increase visibility. 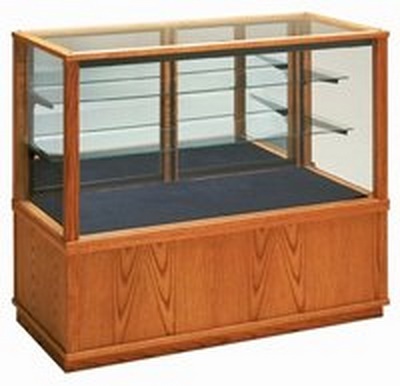 This wooden full view display case is highly durable due to its solid wood construction. This display case is perfect for showing off items in a professional display.